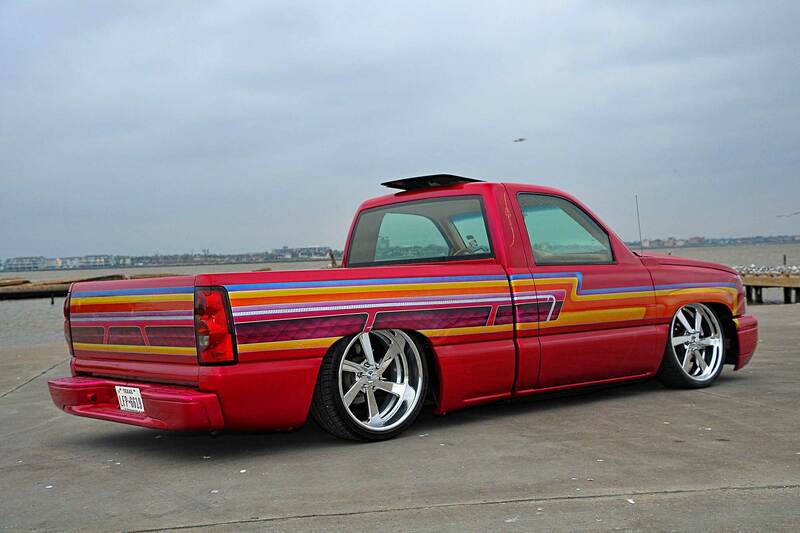 At the time, Adolfo’s friend Luis Villalobos had a 2001 Chevy Silverado that he had purchased new back in late 2000. 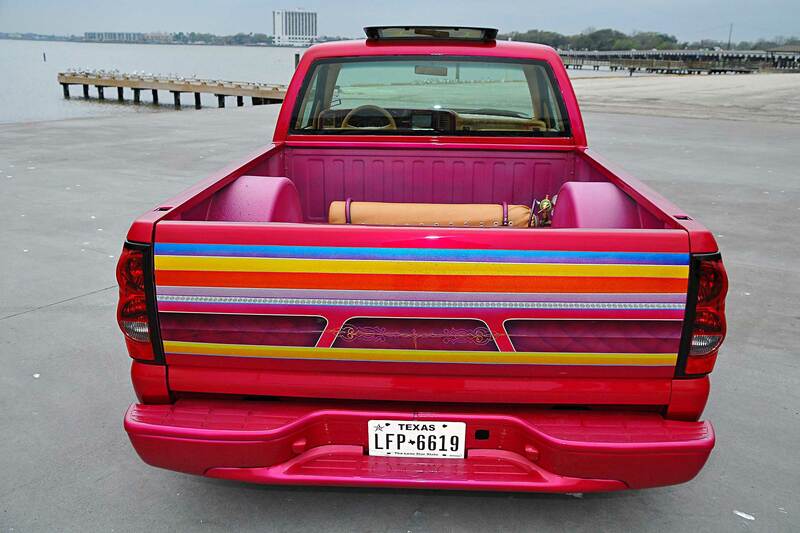 It was painted a bright blue and bagged but Villalobos had lost interest in the aging truck. 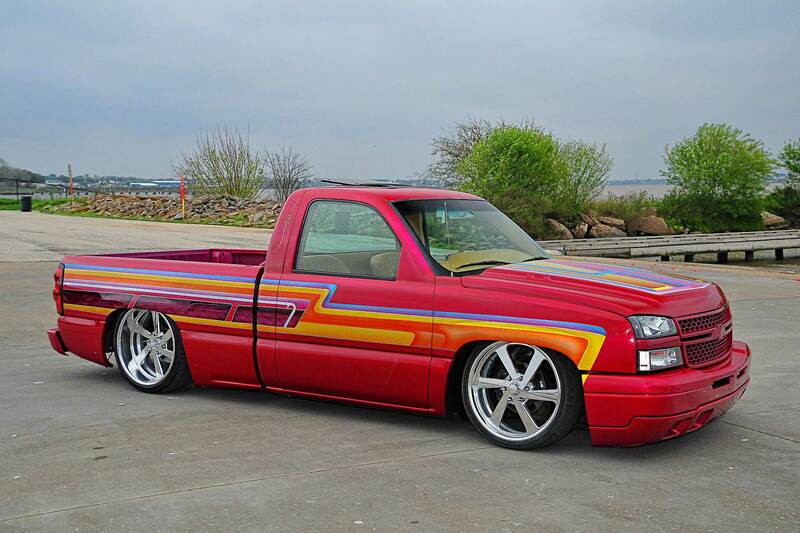 For four years, the Chevy was sitting in a garage untouched, so Adolfo was able to purchase it from Villalobos for a good price. 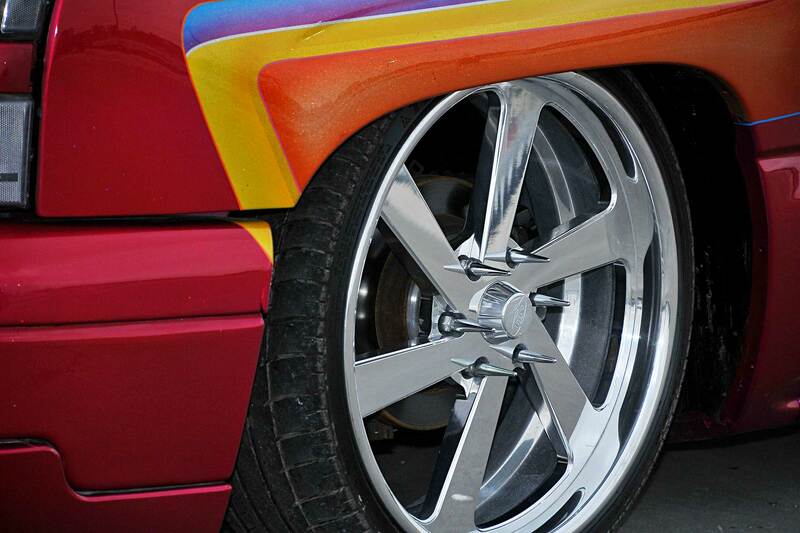 Within months of the purchase, Adolfo blew a tire and hit another vehicle, damaging the entire front end. 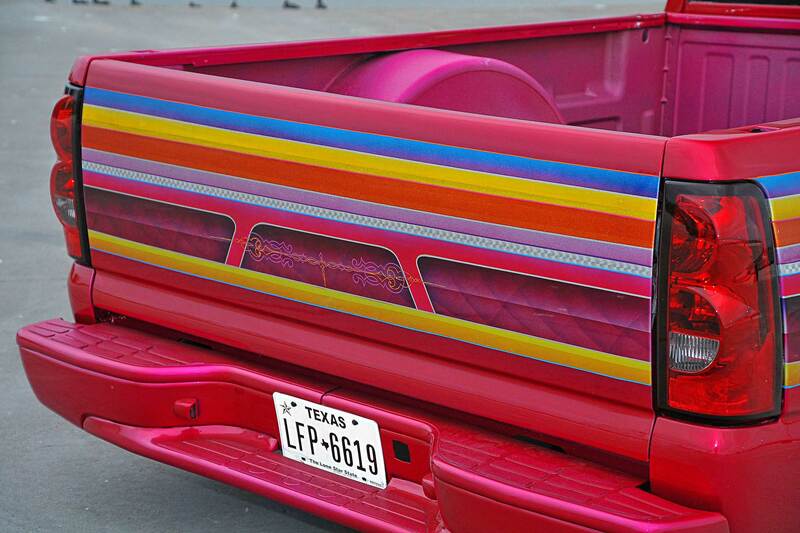 Adolfo enlisted Jose Mendoza of Pistolero Designs in Highland, Texas, based on his reputation for paint and repair. 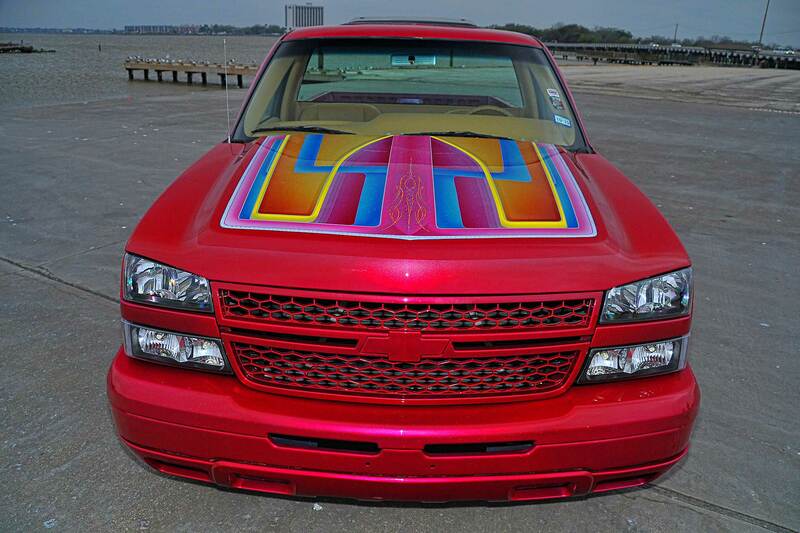 While under the knife, Adolfo had a 2006 Chevy HD front end added, along with taillights in the rear. 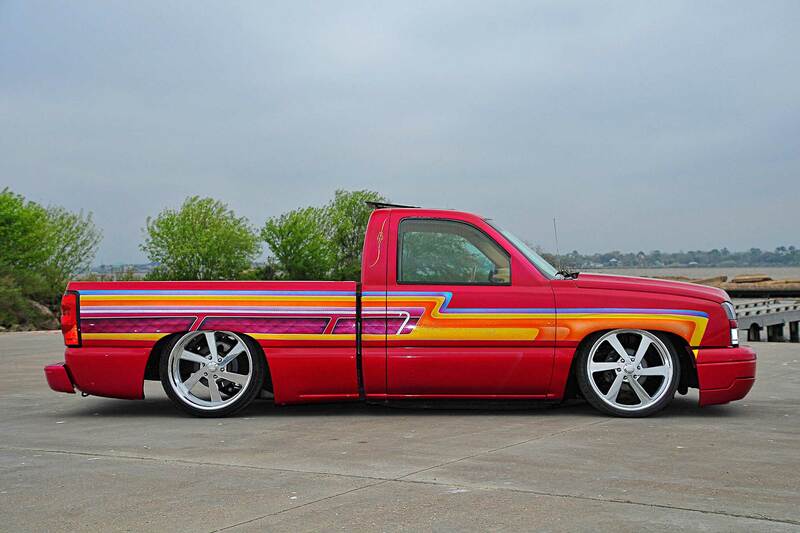 After a few months of driving the repaired bright blue truck, Adolfo decided it was time to integrate the lowrider style onto his new truck. 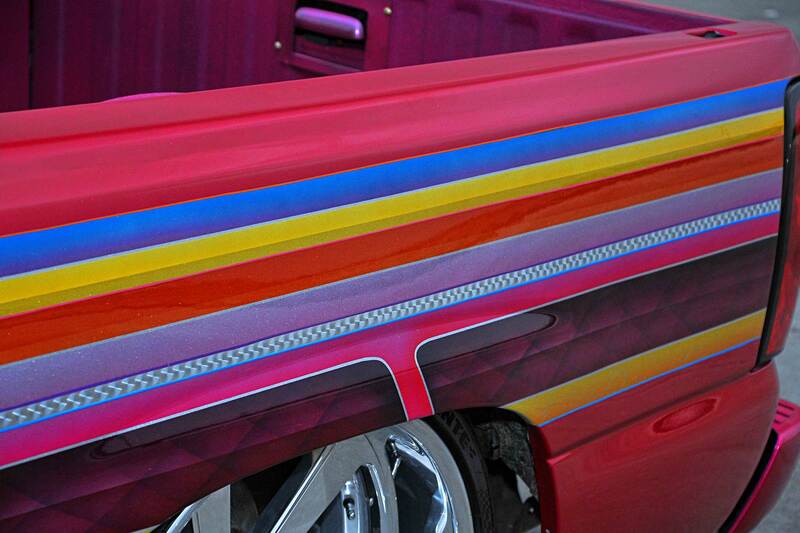 Heading back to Pistolero Designs, Adolfo and Mendoza came up with a perfect combination of Kandy colors from House of Kolor, including Magenta, Tangerine, Pagan Gold, Oriental, and Wild Cherry. 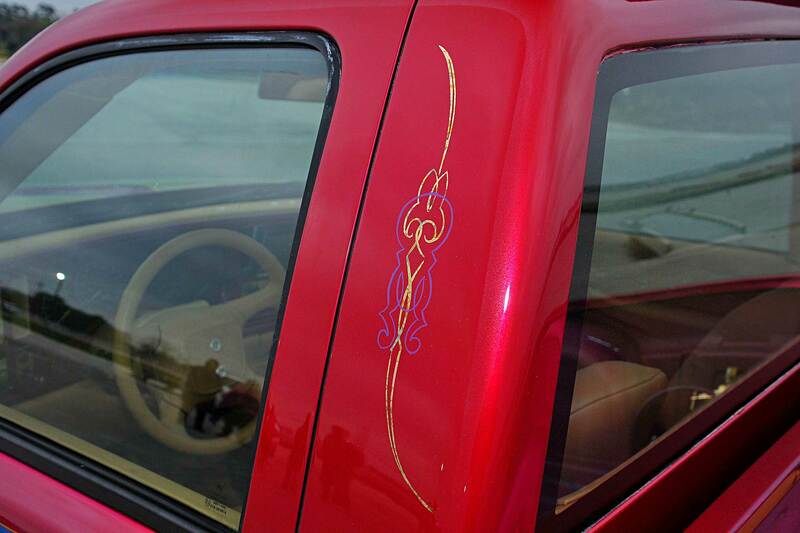 Silver flake was added throughout to reflect the Texas sunshine. 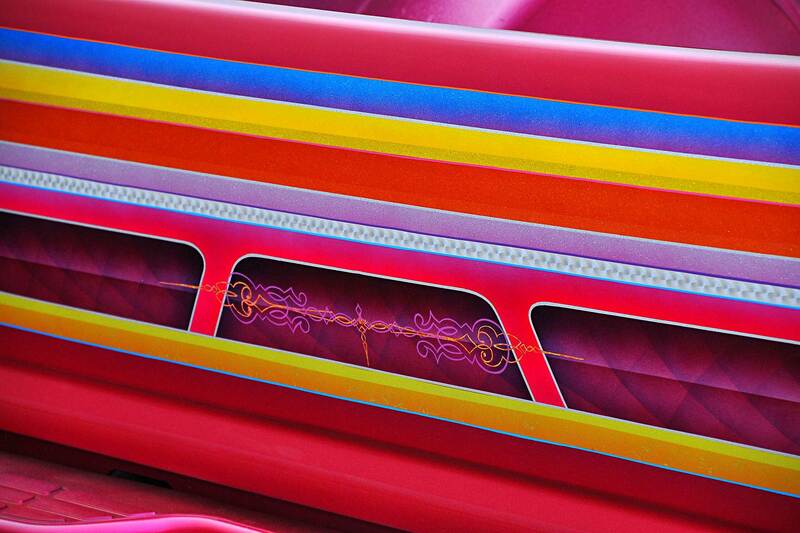 Mendoza added custom murals in both doorjambs along with silver leafing and pinstriping throughout. To clean up the bed, the rear tubs were cut to fit the new Intro wheels. 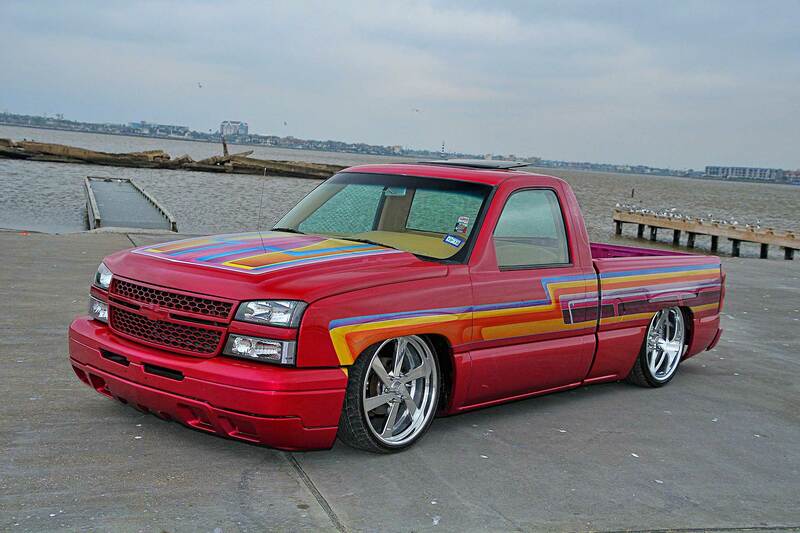 The gray cloth that was inside no longer fit the outside style, so Adolfo brought the truck to Chino’s Custom Interior in Houston. 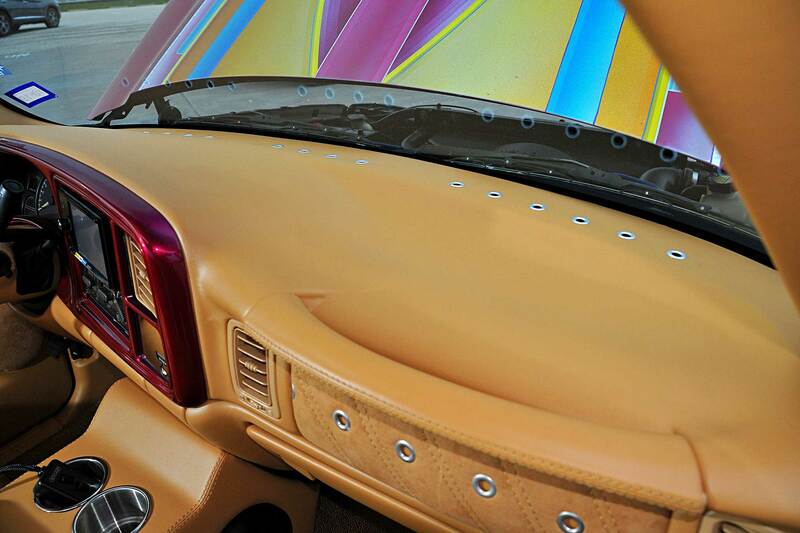 Inside, the bucket seats were removed and modified to sit lower than stock. 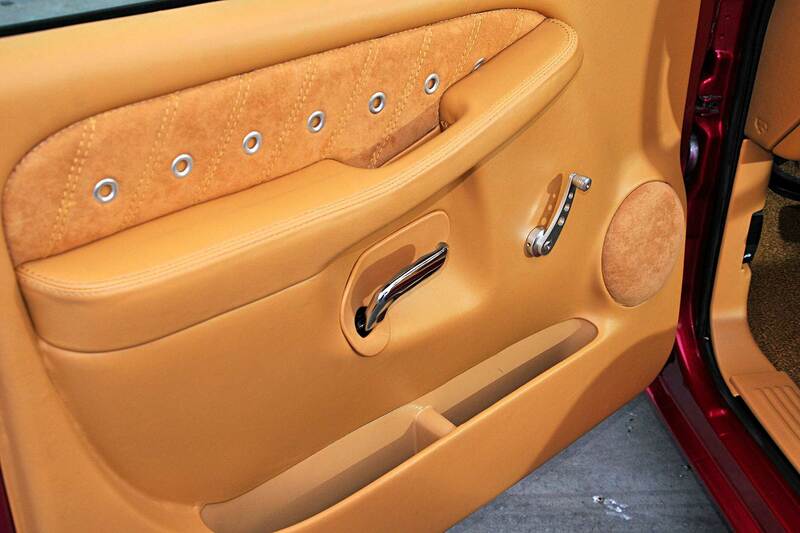 They were both wrapped in high-end Peanut Butter leather and suede with metal grommets down the center of the seats. 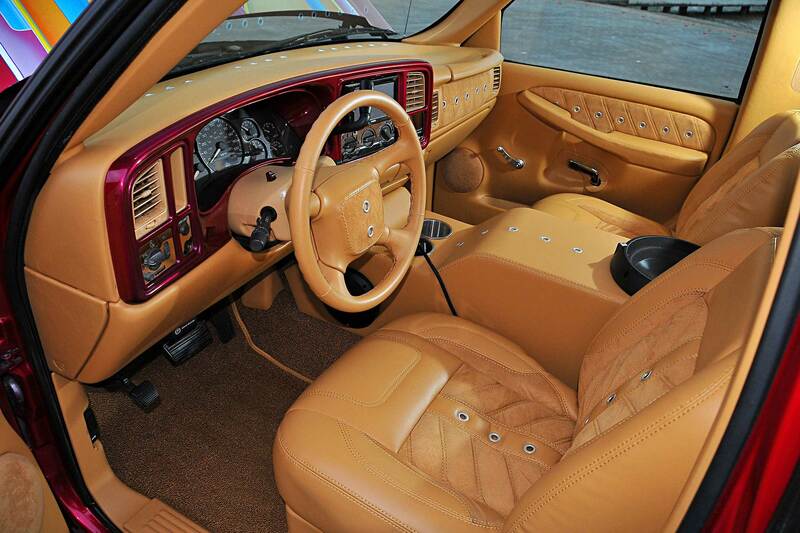 The center of the steering wheel was finished in suede with matching grommets. 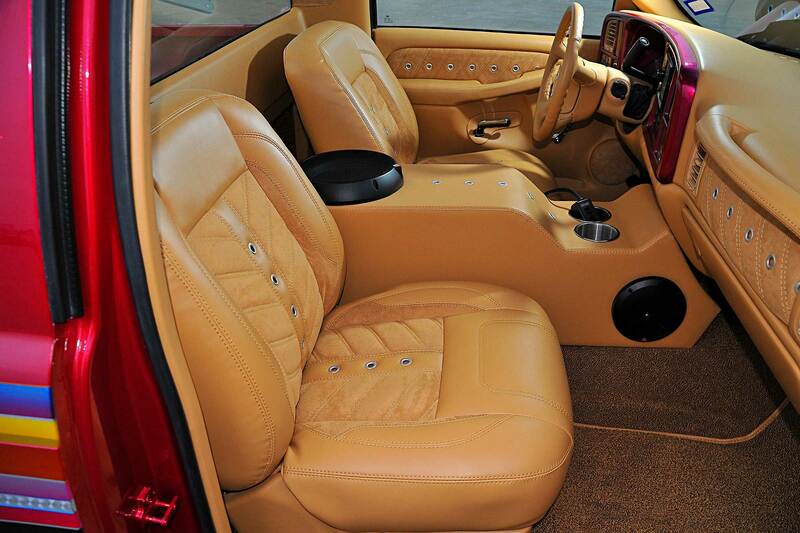 Brown carpeting was laid down to contrast the lighter interior color. 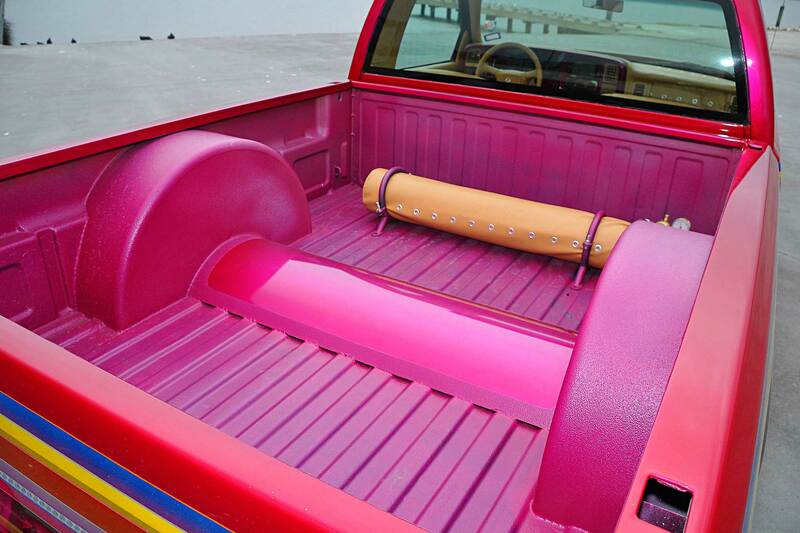 A custom center console was added that housed two billet cup holders and one 10-inch Rockford Fosgate subwoofer. 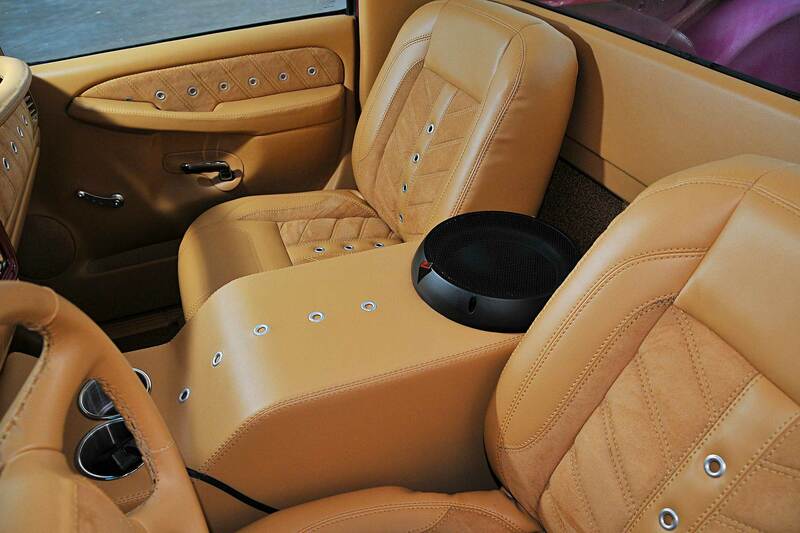 On the side of the console and the door pods, Rockford Fosgate components were added for sound quality. 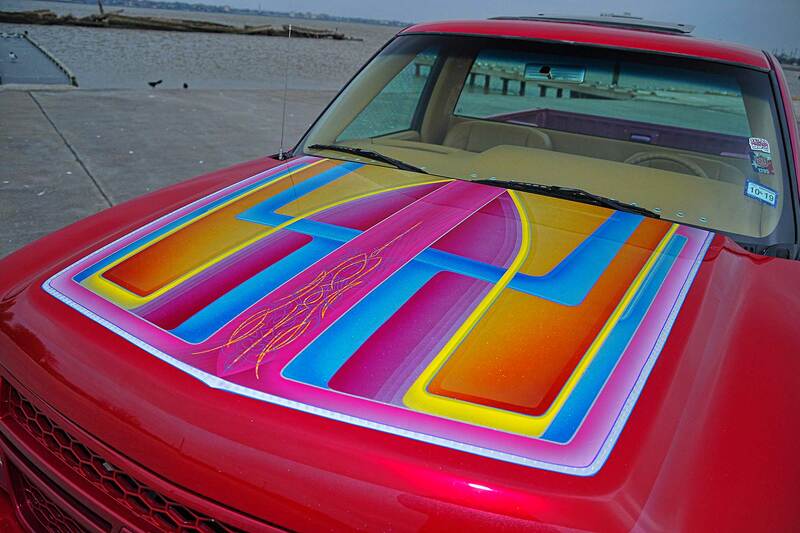 A custom sunroof was added for those long cruises through the city. 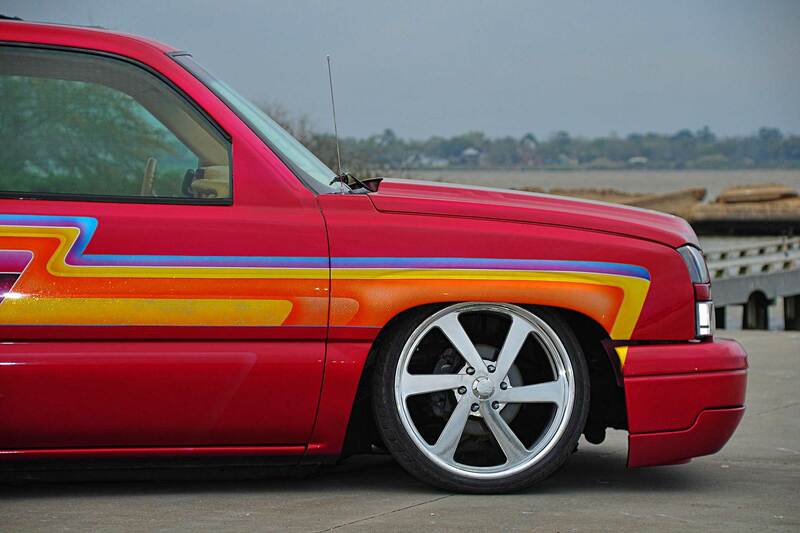 Adolfo gave his Chevy Silverado a completely new life from its time as a blue-bagged truck. 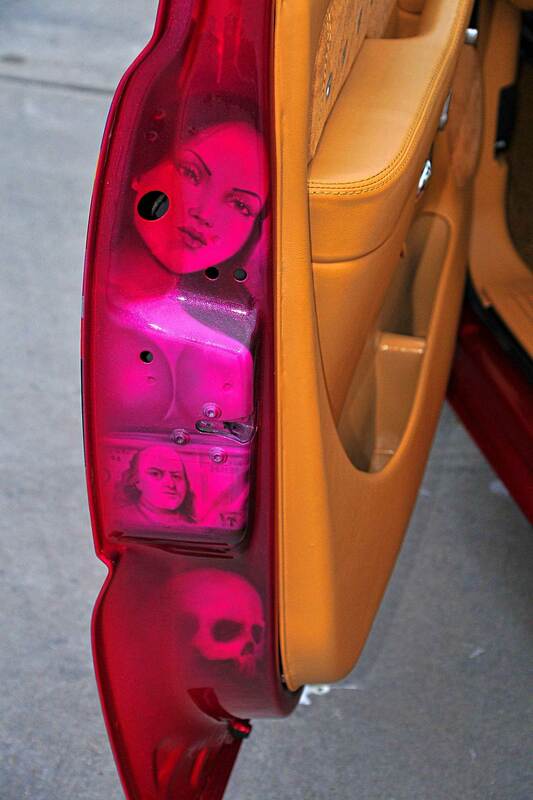 The suspension was done right from the beginning, so it didn’t have to be redone or changed. Aside from that virtually everything was revamped and is now unrecognizable to anyone who knew its first life. 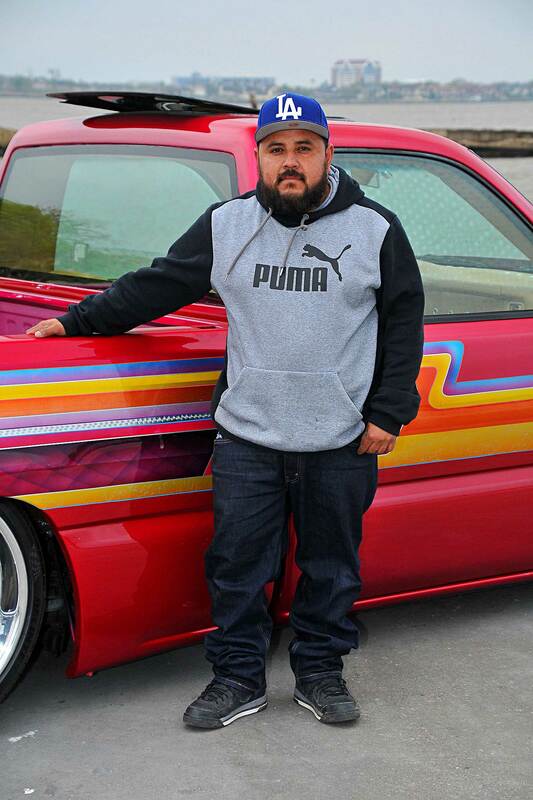 Adolfo wishes to thank his wife, Ludy, for all her support and their two children, Adolfo Jr. and Abril, for their love and understanding throughout the Silverado build process. 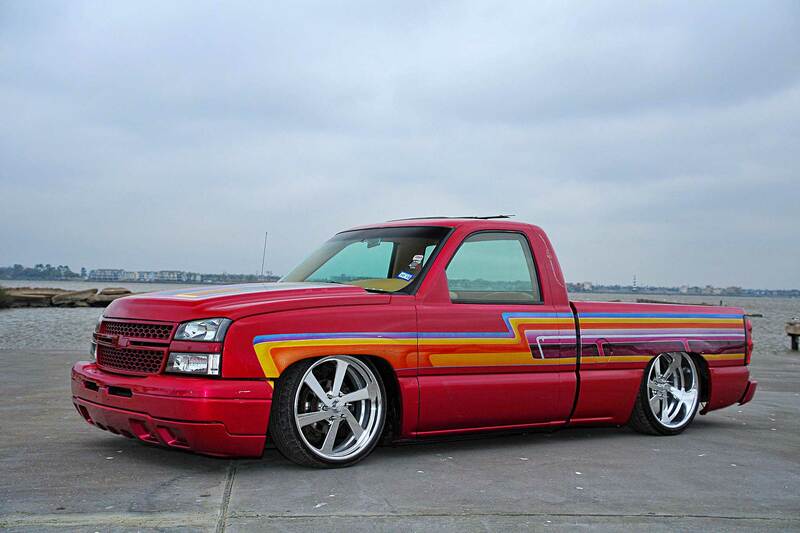 A special thanks goes to Luis Villalobos for parting ways with the Chevy and allowing Adolfo to enjoy a new build. Lastly, thanks goes to Pistolero Designs for the paint and for understanding his vision of making a masterpiece as well as to Chino’s Custom Interiors, Mark from Slaughter House for building a solid bag setup, and Mando’s Drop Shop for the tubs, and to everyone else who had a hand in assisting with the build. 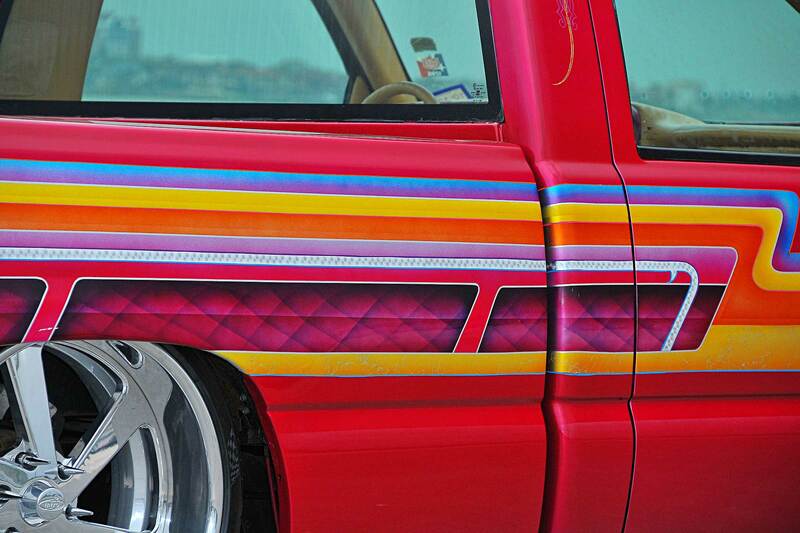 You can take the man out of the lowrider, but you’ll never take the lowrider out of Adolfo’s heart.